The Annual Holiday Show begins on the Saturday before Thanksgiving and ends on the first Sunday of the new year. 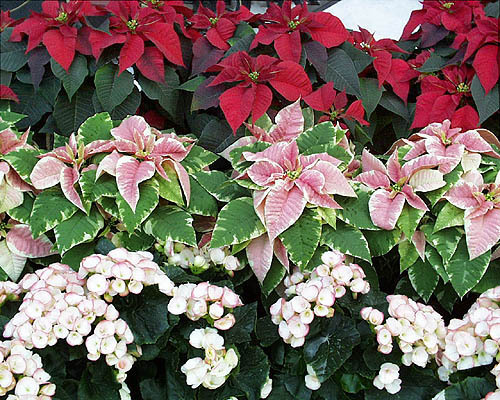 Not surprisingly, visitors expect to see many unusual varieties of poinsettias. And they are not disappointed by over 2000 poinsettias used in every Holiday Show. But they are also treated to blooming begonias, cyclamen, euphorbias, amaryllis, narcissus, anthurium, gloxinias, and the greenery of rosemary and numerous foliage plants. Each year's show portrays a unique theme. Toyland and the Snow People are just two of the fascinating themes of previous Holiday Shows. In recent years, trains and vintage St. Louis have been incorporated in our Holiday Shows.